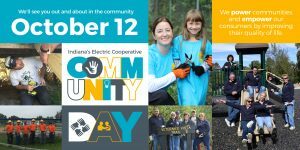 Indiana’s electric cooperatives will host the fifth annual “Indiana’s Electric Cooperative Community Day” Friday, Oct. 12. Twenty-six of Indiana’s electric cooperatives will complete a project that meets a specific need within their service area. Working side-by-side, Indiana’s electric cooperatives will demonstrate one of the core cooperative principles: concern for community. Nearly 50 unique service projects will be completed as part of this initiative. This initiative provides the electric cooperatives the opportunity to use their time, skills and expertise to make a positive impact throughout the state of Indiana. “A cooperative’s very reason for existing is to serve its community. Indiana’s electric cooperatives take their responsibility as trusted members of the community seriously and are committed to being a benefit to those we serve.” said Rufatto. In addition to Community Day, Indiana’s electric cooperatives are involved with philanthropic activities throughout the state of Indiana and beyond. Since 2012, electric cooperative linemen have electrified five Guatemalan communities that previously did not have electric service. Indiana’s electric cooperatives have also been a proud supporter of the Ronald McDonald House since 1995.